Clearly, my lack of regular posts means I have not quite gotten back into the swing of things with the start of the new semester. I won’t bore you with all the details, but know I am sitting down to write every day, as often as I can. I hope you are enjoying The Tale of Two Mountains so far, and you keep coming back to read, even though I have yet to get my groove back. There is a lot of pressure in trying to turn out a finalized, publishing-ready chapter every-other-week or so. Don’t get me wrong, I am glad I undertook this project, even with the stress involved, because it is hard, as an author of YA Fantasy, to know exactly what to blog about, to capture the attention of the young adult audience (especially in this age of electrons, where attention spans can only be measured by the speed of neutrinos, and most people would rather listen to a podcast or watch a video than read a book), so I figured the best way to increase interest would be to show my work. When I began writing this story a few months ago, I hoped it would help bring in readers of fantasy, which, let’s face it, are the people authors of fantasy need most. It is working, but while I intend to continue writing Isabella and Noel’s story, I think it would make posting more regularly a bit easier (and take off some of the pressure to produce biweekly solid chapters of a lore story that is integral to The Eleventh Age, which is nearly impossible without a thousand other things going on), if I wrote more often about other things. Posting more often would mean putting myself out there more regularly, building the fan-base, but again I am back to the original struggle of what readers want to read about when not… er… reading. This website has recently celebrated its first anniversary, so it is time to start asking for your feedback as fans. If you are a young adult fantasy reader and are enjoying The Tale of Two Mountains, or have already read and loved The Eleventh Age, and are waiting patiently for the second book, I’d like you to tell me what I can do better on this site. Feel free to comment below, letting me know what else you might be interested in reading about on this blog. Do you want to hear more about my family life (Fast Girls and Rock Stars, What I’ve Learned About Experience…)? Are you interested in knowing more about my writing process (A Fate More Than Metaphors, Nature of Evil…)? Do you enjoy random articles about things I find interesting or curious (Love Stories, The Moral of the Story…)? What do you think I should write about, to attract more readers like you? Let me know, and thanks in advance for your input! 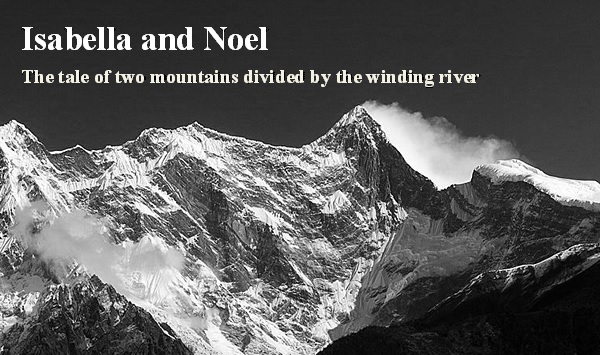 But before you run off, enjoy the latest installment of The Tale of Two Mountains. “The wanderer lives,” she pleaded with him. Isabella knew the old mother was right. Harvey should not be there. “I will stay,” Harvey answered sharply, then swallowed as he took Isabella’s blackened fingers in his, being careful not to hurt her. He need not have taken such care. No feeling remained in her hand, and she could no longer move her fingers. It was as though it did not even belong to her. He gave a brokenhearted smile and raised her dead fingers to his lips, kissing the backs of them, the tears in his eyes so startling to her that she forgot to tell him he had to leave. For a moment, he looked as though he might do as their mother said and say a thousand words he had never had to say before, a thousand words neither of them had ever considered, their lives having long been dictated by their mutual commitment to the Mdonyatra, but at the sound of footsteps in the hall, Harvey looked over his shoulder then hurried to his feet, as Isabella’s father rushed through the door, followed closely by the middle mother and the rest of the Mdrai. “Issa,” her father whispered, taking Harvey’s place by her side, kneeling over her, pulling her up into his arms to hold her close, kissing her cheeks as he had not done since she was small. “Sweet, gentle Issa.” There were tears in his eyes as well. “He lives,” she warned. As her father blinked, his tears fell, and for a brief moment, Isabella saw herself reflected there in him. She looked frail and broken, and her body shook lightly in his arms. She expected him to have the answers, to tell her what they intended to do, but soon his eyes changed, alarmed by her words, and he laid her back on the ground. “The wanderer lives,” she said as her father glanced back at Harvey, who shook his head. He had not understood her. No one understood. “What is happening to her?” Omdra Yang asked as the little mother, her arm dressed with bandages, came to sit on her knees, at Isabella’s other side. Her eyes were gentle, despite all that had happened. Unbothered by the events of earlier, she took Isabella’s morbid hand, examining it once more, running her fingers over the necrotic contusions that ran from the tips of her fingers up past her elbow, death still spreading. “Moag will finish the work it began in her last night,” she answered simply. “Why now, not before?” Omdra Wallace clarified, sharing a concerned glance with the other Mdrai gathered there, looking down at Isabella, with dismay, even disgust, none of them bothering to conceal their sense of shame at what had become of her. The eldest mother joined them in their circle now, resting a hand on Zo Asan’s shoulder. “After receiving his discipline, Young Harvey retrieved your daughter for us. We have many questions, as many as you must have, but they will likely go unanswered, and we must accept this. We do not understand how she managed to survive her first encounter in the tunnels, and she did not have time to tell us much of her endeavor before she was overwhelmed by Moag once again, right there in front of us. Young Harvey was there and can confirm, the moment elf entered one of the forbidden tunnels, Young Isabella was wrenching around on the floor in agony. As you can see, her right arm is the source, and she has already begun to deteriorate. “Sand?” Omdra Yang said curiously. “How long will she be forced to endure this?” Omdra Vega asked, his voice hoarse in his throat. With that, Isabella’s father left her, carrying her robes away, not once glancing back– not in anguish, not in sympathy, not in pity or despair. Not even in love. Though it was strange to her that she might want all of those things now. “Pati,” Isabella cried, choking out the word, as he turned the corner into the hall, but the cry was stifled as the torment inside of her returned, swelling with so many ideas she had never felt before, because there was no need to feel them here in their mountain, where life was simple, their duties apparent, where the Felimi had a saying for everything and the Mdrai administered to Fate and their people with unyielding faith. Until now. “Is there nothing we can do?” Omdra Wallace asked, turning his head away as the blackness crept up Isabella’s veins and tears spilled down her cheeks, as she fought the rising current inside her, pushing her feet against the ground, her back arching as the little mother struggled to hold her still. She had been betrayed, abandoned. She was lost. Harvey had remained silent as the Felimi and Mdrai discussed what would happen, no doubt faithful they would find an answer that would save Isabella, but now, as the others began to turn away from her, his reserve broke. “Wait! Issa made it out of the tunnels alive,” he insisted as Omdra Vega took him by the elbow to lead out of the room. “She died, yet as with the wanderer, Fate did not take her.” He pulled his arm free and hurried back to Isabella, with Vega on his heels. “Perhaps the wanderer will make it through the tunnels as well, and she will be safe. Can you not see there is still hope?” Vega caught him just as Omdra Yang took his other arm, and the two men tugged at him as he dug his heels into the ground, calling out, “No! Issa! I will stay! Issa!” as they dragged him away. Finally Omdra Wallace, who was quite a bit larger than the rest, picked him up from behind and carried him out the door, hushing him in a gruff voice as they went, reminding him of his place, his duty as a Child of Danguin, and the lashes he had already received. “Harvey,” Isabella sobbed, as their voices carried off down the hall and the Mardraim, who had remained away from the group, came forward, his hands clasped easily in front of him. “You should go with the others, Young Edward. The child’s death will not be easy for any of us,” the eldest mother said, crouching down at Isabella’s side as the convulsions began. “I can. I wonder, though, if it could be the wanderer’s language?” the man asked, bending down next to the elderly woman, using the sleeve of his robe to wipe the saliva from Isabella’s face and neck. “This is a curious question,” the young mother said, letting go of Isabella’s shoulders, sitting back on her knees. “Of course. Unfortunately, we will never know what she is saying,” the elder mother offered. “He told you, yet you chose not to divulge this information to us as well?” the eldest mother scowled, all pretense gone. “What do you mean, ‘Eradicate whole destinies?’” the eldest mother asked, the apathy in her voice unchecked. “What are your intentions?” the middle mother asked, hands on her hips, her anger clear in the starkness of her voice. Those words– those unthinkable words– caught up in Isabella’s head, igniting a blaze of frenzy inside her. “Kill him,” Moag had spoken in her ear in the voice of her Mardraim. This was not possible. The Mardraim was a father to all of their people. He was a good and gentle man, who lived his life by the tenets of the Mdonyatra and the Ftdonya as an example to everyone. Even in the nightmare she lived up in the tunnels, Isabella had known the Mardraim would never speak those words, let alone consider acting on them, yet here he stood saying those impossible words to the Felimi. He would never kill another person, not even to put them out of their misery, not even to save another life—not even to restore Fate. She was still dreaming, she thought, her body tensing then concussing against the floor as Moag overtook her completely once more. She was still somewhere up in those tunnels, trapped in the nightmare, being ripped apart. “I will stay with Issa,” she heard the Mardraim answer. “Wake up!” Isabella cried, a torturous fist ripping at the core of her. “We must silence her,” the young mother said, a hint of fear in he words. “Leave here, Edward Frank! Forget about the girl!” the middle mother demanded. “There is nothing any of us can do to help them!” the middle mother shrieked in rage. Isabella clung to the sound of the woman’s voice, like a beacon of light piercing the darkness inside her. “We are dreaming,” she panted. “Edward suspects,” the little mother whispered as the heavy door slammed shut, the echo thundering through Isabella. “Not yet,” the elderly woman answered. “How did she do it?” the young wise one asked. “May you find peace,” the little one whispered, pressing her hot lips against Isabella’s forehead, and Isabella felt the sting of her flesh coursing through every atom– through Moag. Noel shuddered in the darkness. He was not alone.